A Play performs one or more Tasks against one or more Managed Nodes. A play map a group of hosts to some well defined roles, represented by tasks. Plays run in the order specified: top to bottom. host defines the target machines: one or more groups or host patterns, separated by colons that should match hosts in the inventory. all is a group that means all hosts in the inventory file. shuffle: Hosts are randomly ordered each run. max_fail_percentage – max_fail_percentage can be used to abort the run after a given percentage of hosts has failed. 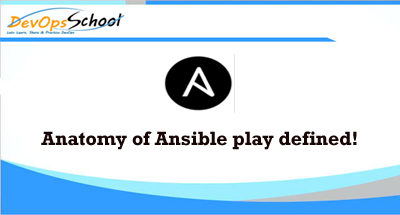 strategy – A strategy ships with Ansible – free – which allows each host to run until the end of the play as fast as it can. any_errors_fatal – With the ‘’any_errors_fatal’’ option, any failure on any host in a multi-host play will be treated as fatal and Ansible will exit immediately without waiting for the other hosts. Lets understand each piece, let’s look at the overall construction of a Play. Playbook – A Playbook is a file containing one or more Plays. # vars, environment, pre_tasks, roles, tasks, post_tasks, etc.